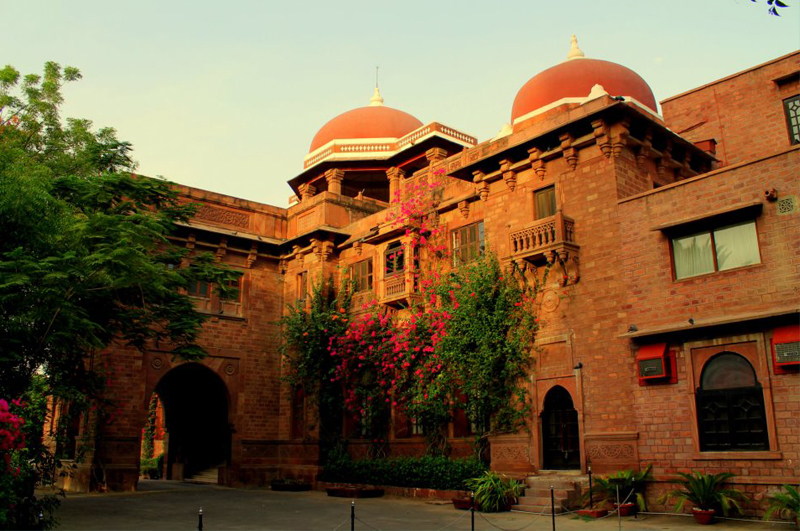 Ranbanka Palace Jodhpur: The magnificent sandstone building, built for Maharajadhiraj of Jodhpur, Sir Ajit Singh ji, the younger brother of Maharaja Umaid Singh, tastefully blends the lavish interiors and modern comforts. Present day facilities are harmonized so as not to disturb the antiquity of the royal abode. 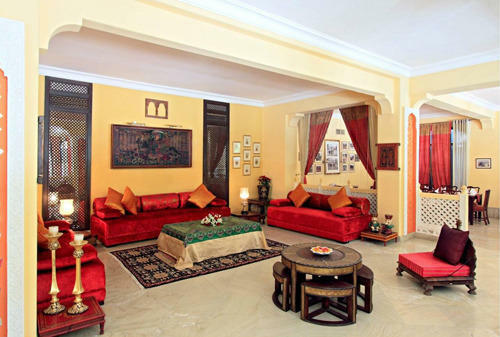 The Ranbanka Palace has 70 rooms that include Royal Suites, Luxury Suites, and Club Rooms and Deluxe rooms. Each room compliments the character of the Palace. The luxurious bathrooms in all the rooms feature a shower or bathtub, hairdryer and enhanced amenities with individual balconies and terraces overlooking the gardens. The Ranbanka Palace Hotel Located at Circuit House road, in the heart of business and entertainment center of the city, 05 kms from the airport, 3 kms from railway station, 1 kms from Roadways Bus stand. 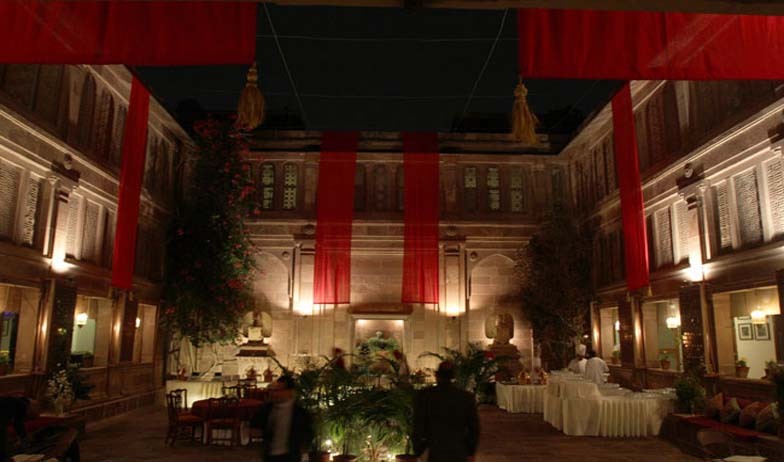 This Palace Hotel is one of the Foremost Heritage Hotels in Jodhpur, Rajasthan and has always stood for an unparalleled experience in hosting grand occasions, banquets, formal gathering and meetings. Use of rich fabrics and silk drapes draw from the colorful art and warm hues of the state of Rajasthan. Restaurants, Bar, gardens and Swimming Pool. An experience of a variety of activities customizes to suit the guest. All rooms are air-conditioned and have attached spacious bathrooms, 24 hrs. Hot & cold water, direct dial telephone, color TV, refrigerator, room service and 24 hrs, satellite entertainment, Wi-Fi. Indoor air conditioned dining area seating 150 covers, multi cuisine restaurant which overlooks the center courtyard; it is inspired by the Five Royal Colors of the Jodhpur flag. It has a very colorful and traditional ambiance. Mini Bars / Mini Fridge, Tea/Coffeemakers & Air-conditioning. Upgrade to Club Room when you book a Deluxe Room. Rooms starting from Rs. 6000/- onwards. Ranbanka Bagh: A major attraction open for dinners is the Garden restaurant a choice between a large buffet and A La Carte, while dining the traditional dancers keep the evening vibrantly alive. Marriages and social get together can also be hosted here. 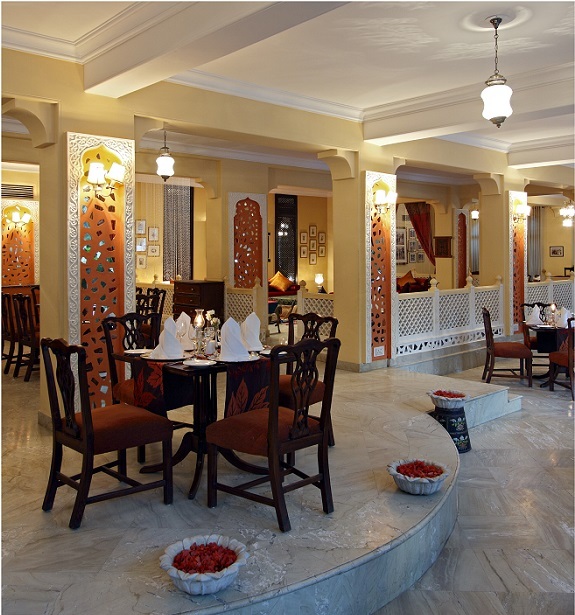 Pancharanga Restaurant: Indoor air conditioned dining area seating 150 covers, multi cuisine restaurant which overlooks the center courtyard; it is inspired by the Five Royal Colors of the Jodhpur flag. It has a very colorful and traditional ambiance. Polo Bar: has got the original Polo trophies which have been with the family for generations with add-ons by the promoters Raj Kumar Karanvijay Singh (Grand son of Maharajadhiraj Ajit Singh Ji), a polo player who has participated in major National and International tournaments. Rajasthani Baithak: Lounge in a true Rajasthani set-up (on Bajots & Gaddi Massons) one actually goes back to the bygone era as the hotel staff pampers you with the royal hospitality .The infamous thali prepared by second generation chefs of the Royal family is lavish treat. Rajput Hall: At Ranbanka Palace, meeting room is available for corporate meetings, seminars and social events. Weddings & Social Functions: Marriages may be made in heaven but they are sealed at Ranbanka Palace. Celebrate the most important day of your life with style and imagination in the splendor of beautifully manicured poolside lawns. To book, call us at: 91-98108 80020 or you can write to us at: [email protected] for exclusive rates. Our rates are 30% less than any online rates – Guaranteed. Upgrade to Club room, when you book a deluxe room. Note: The room rate is inclusive of buffet breakfast and all taxes. 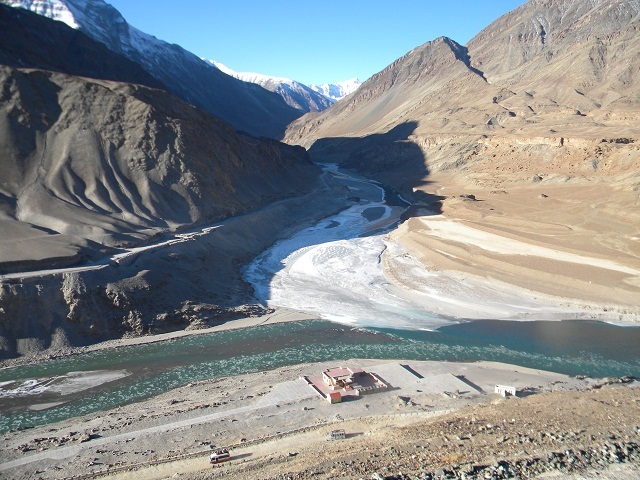 All rates are in Indian Rupees and Inclusive of all taxes. Our check-in time is at 12:00 and check-out time is at 10:00 Morning time. Early arrival & late checkout is subject to availability. All reservations will be held till 1600 hrs after which they will be released, unless intimation of late check in is received or guaranteed by Credit card for late arrival. All amendment and cancellations must be made 24 Hours prior to expected arrival, beyond which retention charges equivalent to one nights room charges will be levied. The corporate rates quoted are applicable for reservations made directly with the hotel reservations through authorized staff from company. They are not applicable for reservations through a travel agency or any other similar intermediary. Payments pertaining to the stay of the guest must be settled directly prior to check out by cash, or approved credit card. In case of a No show, retention charge equivalent of one day’s room rent will be applicable. The above special rates are not valid for any event or more than five rooms on any single day. Mandatory charges during Christmas and New year Gala Dinner per adult: INR 5000. Rates are quoted on per room per night basis, and are only valid for single and double occupancy. Child below 06 years of age can be accommodated free of cost in the parents room without any extra bed. Child above the age of 06 years is considered as an adult and will be charged INR 1,500 inclusive. Maximum occupancy per room is two adults plus one child/adult. Room availability and rate may be subject to change if amendments are made to a confirmed booking. This offer cannot be used in conjunction with any other programmes. This offer is not valid for Group Reservations. Hotel check-in time is 12 pm and check-out time is 10 am, any early check-in or late check-out will be subject to availability and will be charged accordingly.